The year 2014 began a few days ago and after wishing everyone a happy new year it is time to get back to the dôjô. As Sensei didn’t give us yet, the theme for the year of the horse of wood, I have decided to begin the year by digging a little more into the concept of 流れ, nagare (stream, current, flow). Everything we do on the mats is related to this concept. When I announced that I would focus on 流れ, I was surprised to receive immediately a message from my dear friend Sven saying: “This is interesting Arnaud, my intent exact. Nagare (flow) is my “new beginning” for the day seminar the 4th January”. Even though I’ve been training in the Bujinkan for 30 years, I can’t help being amazed when this type of coincidence happens. This is not the first time and surely not the last. To begin the year with 流れ, nagare was somehow quite logical for me. It was like an obvious choice. Hatsumi sensei has been teaching footwork for many years emphasizing the importance of distance and “no strength”. When you look at how those different concepts mingle together, the word 流れ nagare comes to mind immediately. Because if you position yourself correctly by using the adequate footwork then there is no need for strength and the movements flow naturally from the situation. The Bujinkan is 流れ, nagare. Nagare is THE answer. 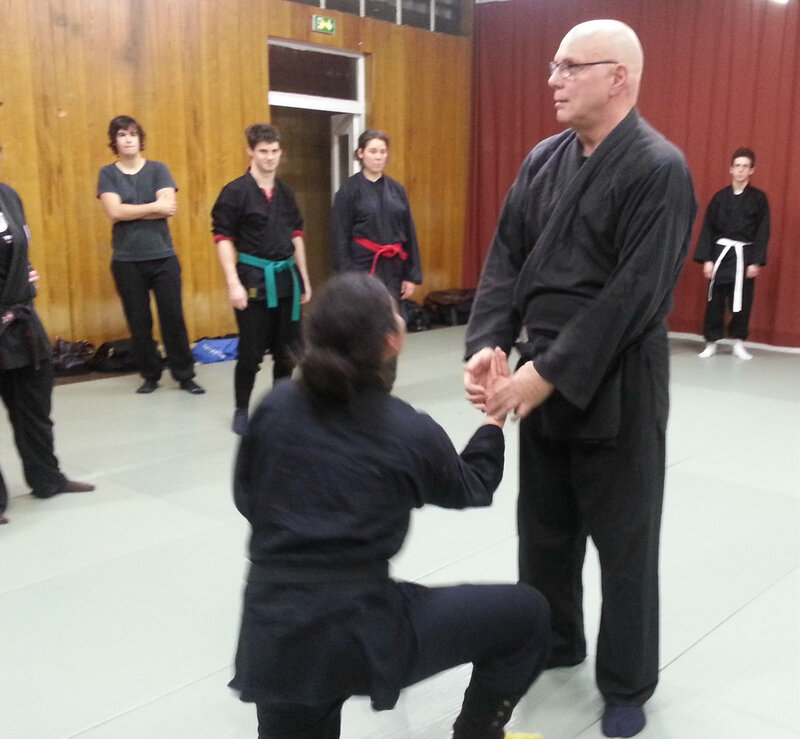 But when you look at a class you notice that Bujinkan students are often stuck in a 1, 2, 3 way of moving. It seems more like a bad “kata” than a real flow of action. At beginner’s level, to study the 1,2,3 steps is necessary in order to learn the sequence and to absorb it correctly within the body. But with the development of expertise if you don’t go there you end up mimicking movements that have nothing to do with actual reaction in a real fight. We, teachers, have a strong responsibility here. We have to teach the forms but also to teach in a formless manner. Now, this second phase of the learning process can only be achieved when the forms are known. Forms cannot be avoided. Formlessness comes from well known forms. The nagare is transmitted through, what the Japanese call Kûden. A Kûden is not a secret, it is only the expanation allowing the practitioner to get rid of the form so that he/she can enter the world of natural movement. In a way, Kûden can be seen as the didascaly*, the notes of the author of a play adds to the text to help the actors undersand the situation, the feelings and the ambiance when acting on stage. The play doesn’t need it, but the actors will play better with the help of the didascaly included in between the dailogues. So 流れ nagare will be my study apporach in the first seminars of 2014. And as we are going to have a new Honbu Dôjô in Japan in April, we can see that the year 2014 will be a new start for the Bujinkan getting finally recognized for what it is, a sytem created to render us responsible and mature. And the maturing process is also nagare 名枯れ (reputation growing up, maturing). Enjoy the year of the horse of wood, and don’t get confused with the wooden horse which either has been used by kids to play, or by the Greeks to get rid of the Trojan! Tomorrow go and train nagare with Sveneric Bogsater in Deventer (holland) if you are in the area. Next Post Thank You for the Magic, Sensei! Fantastic blog post and great way to start the year. Wont be surprised if Soke announces this as the theme of the year!